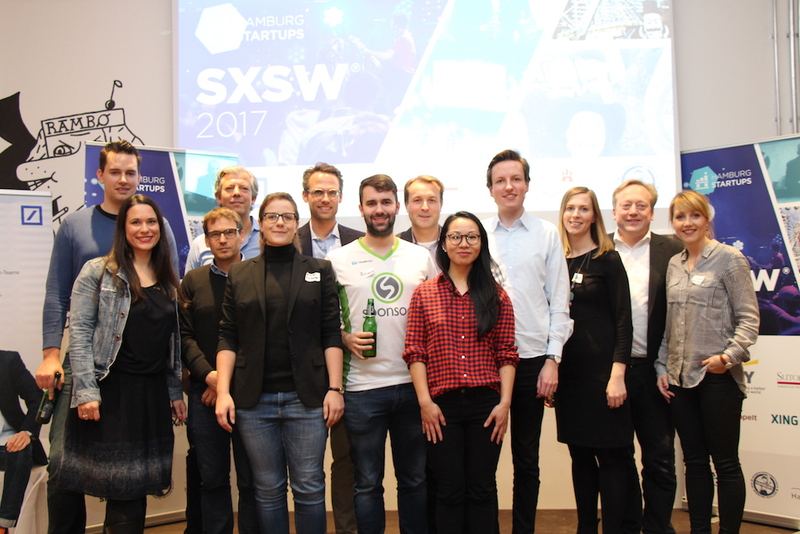 A full house at Mindspace, Hamburg startup personalities and an overjoyed winner: this is what you may have missed out at the Hamburg startups Mixer – SXSW Edition. The audience made up its mind: Nüwiel must represent Hamburg at the SXSW festival in Austin in March! What the startup can expect there and how it came to this choice, this is what our follow-up report holds! If one attends the many scenes of the SXSW Festival in Austin, the days seem to last at least 25 hours. And it’s back from the 10th to the 19th March. 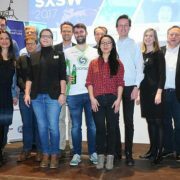 In order for all the participants who fly to Texas to make the best of their time there, many insider tips where shared at Mindspace, where Hamburg-goes-to-SXSW party was held. 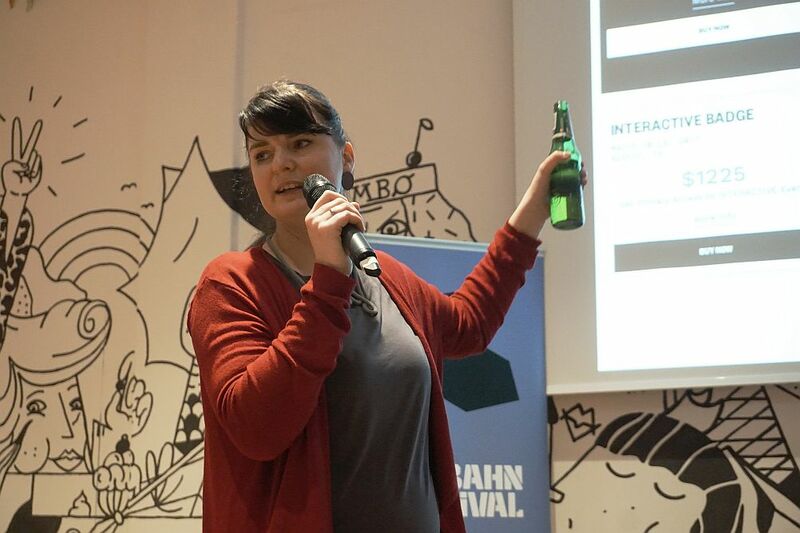 Among the most notable experts: Evelyn Sieber ( Reeperbahn Festival), Johannes Everke (Hamburg marketing) and Sanja Stankovic (Hamburg Startups). Evelyn Sieber from the Reeperbahn Festival had plenty of tips for Austin. Very important: You can only access the really cool and exclusive events with a special kind of badge. These badges are normally sold at a very high price, however some last-minute deals can be done with people who had a badge but could not make it. Whoever is lucky enough to get one of these tickets should plan early and carefully select the events they want to attend. In this case, less is often more for the various locations can be far from one another. Talking about locations: Americans love air conditioning, and while it can be quite hot outside, you can expect a teeth-chattering cold indoors So don’t forget to bring a jacket! More tips from pros can be found here. To give you a clear idea of the scope of the SXSW, here are a couple of figures from last year’s edition. 37,660 participants from the program “Interactive”. 1,377 sessions on this topic. And 3,493 different media wrote about it. Tinnitracks, a Hamburger startup that won the 2015 Accelerator , got themselves over 700 mentions in the press.This is an absolute record! 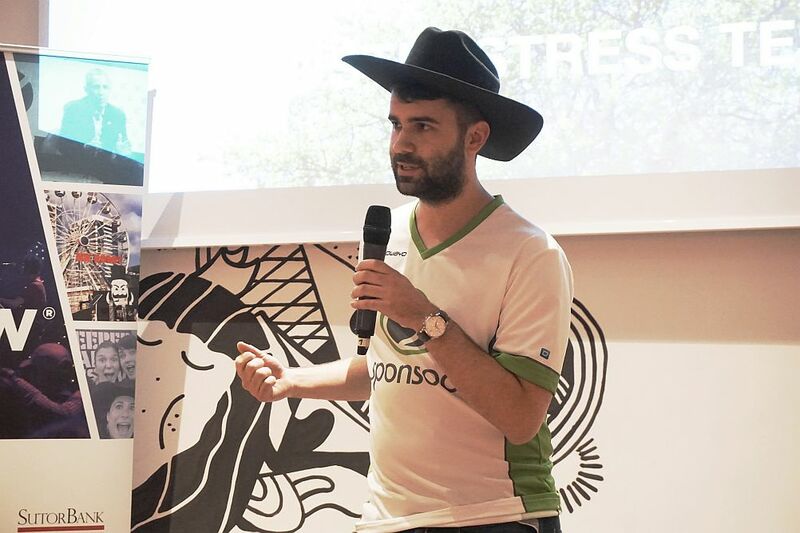 Andreas Kitzing presented his platform Sponsoo – in a real cowboy style. Apart from the official program, there is much to see and to do. Parties, shopping, barbecue restaurants, or a visit to a rodeo, after all we are in the land of cowboys. And it’s always possible, randomly or purposely, to run into the one person who might change your career or the path of your startup. It can happen at an event or at the corner shop alike! It’s is vital to be able to pitch your story in a clear and quick way, whenever the opportunity turns up. Which brings us to the most important part of the evening program. 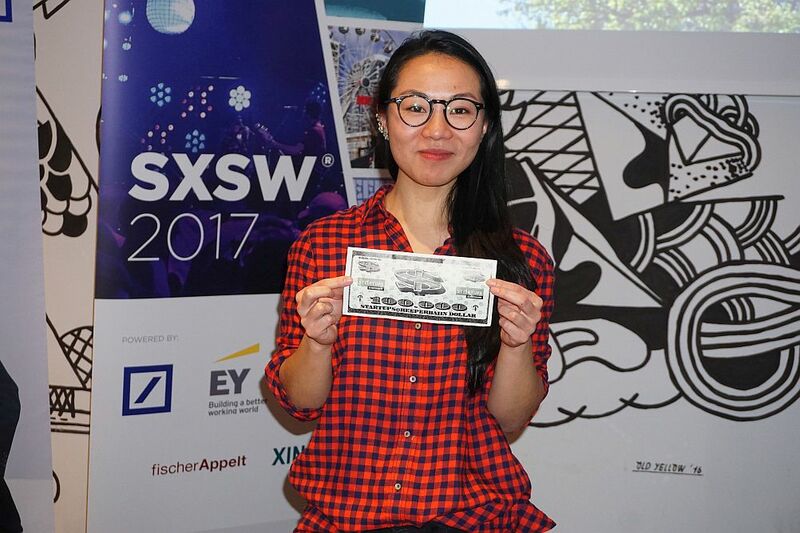 Four startups were lined up to get hold of a ticket for the SXSW (more about the candidate selection here).They introduced themselves to the audience, yet not with the usual five-minute “Death-by-PowerPoint” presentation. Instead, they were given only 60 seconds in the first round to clearly present their business model. This is called an Elevator Pitch, a rather self-explanatory name. Robert Heinecke defended Breeze and got the ball rolling. The candidates were well-prepared, and the four of them tackled the challenge without breaking a sweat. 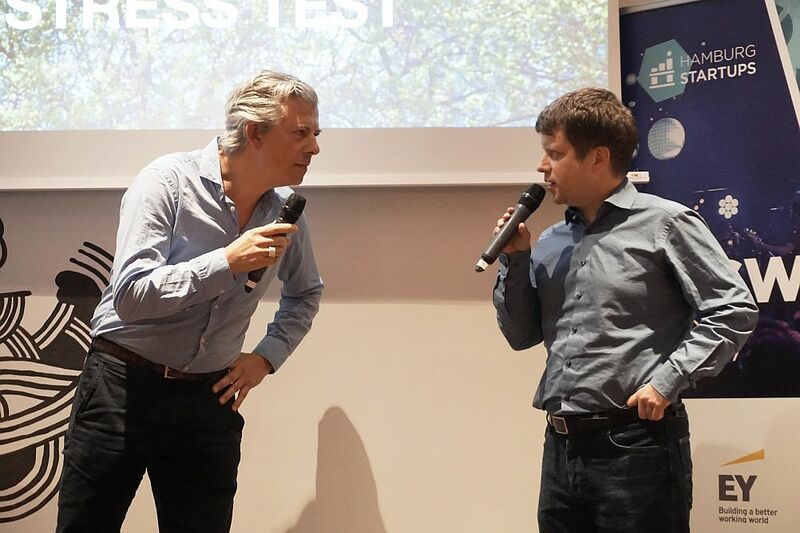 Our candidates and their startups: Andreas Kitzing for Sponsoo , Natalia Tomiyama for Nüwiel , Robert Heinecke for Breeze and Heiko Rahlfs for figo .They were then subject to a “Austin stress test”. It consisted of questions asked by Mark Miller , managing director of the consulting firm CatCap and true Austin expert.Spontaneous questions, sometimes funny or provocative, but always fair and to the point. Heiko Rahlfs of figo listens carefully while Mark Miller tests him. He brought Andreas to admit that his sports sponsoring platform Sponsoo was the Michael Jordan of startups. Natalia from Nüwiel explained that there is no road too steep for their electrically driven bicycle trailer and that she would love to drive a piano and its pianist through Austin to prove her point. Robert, who deals with the measurement of air quality with Breeze, would walk anywhere to prevent exhaust fumes. And Heiko would provide a banking app from figo to avoid another financial crisis at any costs. Needless to say, all of this happened in English. It was not a problem for any of our four candidates who had answers up their sleeves. No doubt that any of the four Hamburg startup could worthily represent Hamburg in Austin. Spoilt for choice, the audience now had to distribute the 100.000 dollar bills (unfortunately not real ones) to their favorites. Whoever collected most bills was rewarded with an SXSW ticket , and the happy winner was: Nüwiel! Natalia Tomiyama of Nüwiel got far more than just a $100,000 bill from the audience for her appearance. 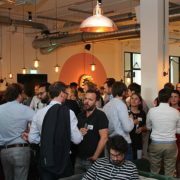 After the audience made their decision, there was still plenty of opportunities for networking, which was done extensively; and this calls for beer of course. Such an event in Hamburg, with financial and organizational support, is only possible with the help of great partners. Without the Deutsch Bank , EY , Sutor Bank , XING and fischerAppelt none of this would have been impossible.Thanks a lot! 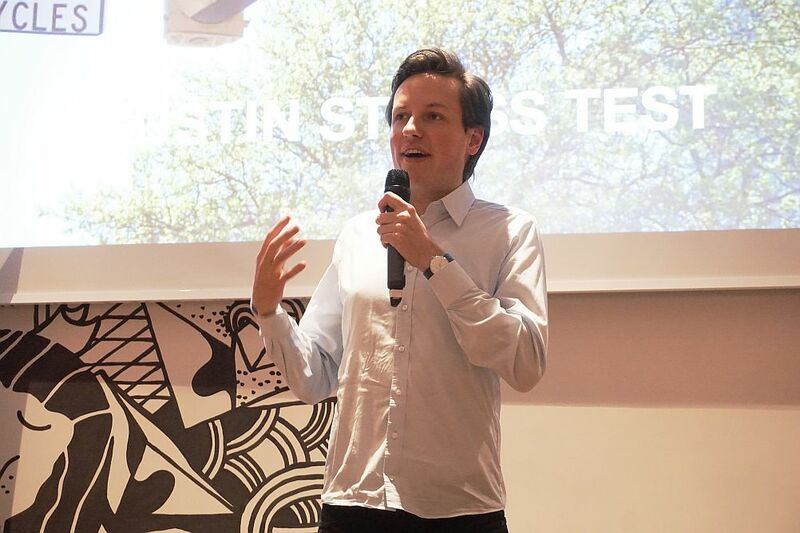 The Hamburg Startups team is delighted that the format, including the “Austin stress test” was so well received.So now: Get ready for Austin! 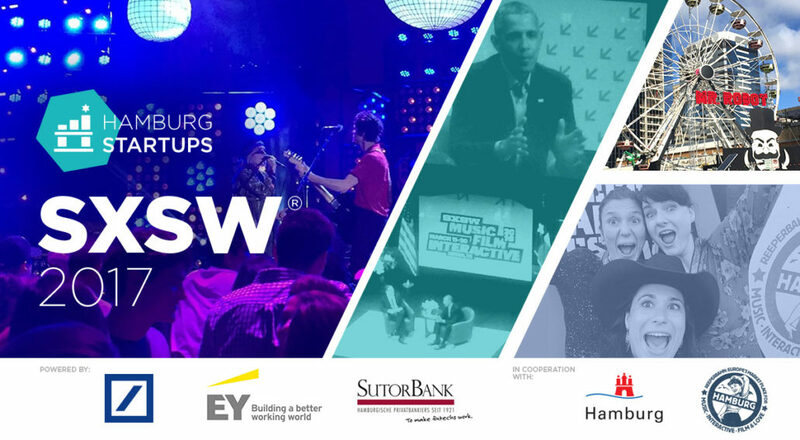 Hamburg Startups have built themselves a respectable image on the South by Southwest Festival (SXSW) in Austin, Texas. Hamburg Startups has been a partner for Hamburg startup activities there and, this year again, it drafted an exciting program for startups. That is how Tinnitracks as winners of the Startups@Reeperbahn Pitches traveled to Austinchosen by the coveted SXSW Accelerator . 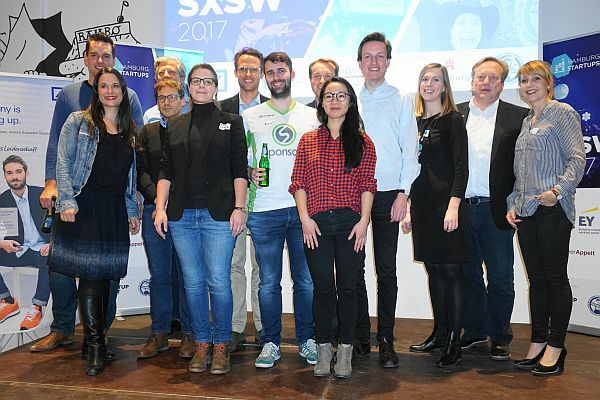 In 2016 Baqend got itself a double victory at the Startups@Reeperbahn Pitch and thus directly secured their trip to Austin in March.Together with our partners the Deutsche Bank , EY , the Sutor Bank , XING and fischerAppelt we will send two other startups on the trip to Austin, along Baqend.